Normal batteries are useless in a digital camera. Alkalines are better, but will still fade after 50-70 shots. They were not designed to meet the very high power demands of today's electronic devices. Alkalines have a high rated capacity, but they can only deliver their full capacity if the power is used slowly, as in a radio or a torch. Electronic devices such as digital cameras place a high power drain on batteries, so the way to go is re-chargable Nickel Metal Hydride (NiMH) batteries. 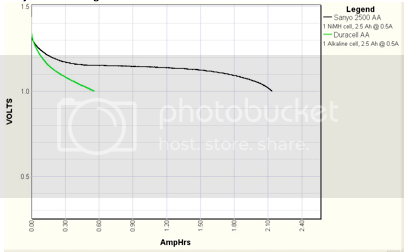 This chart makes the point - the green line is an alkaline battery; the black is NiMH. Yes, they are initially expensive, but after just two charges, they are already saving you money. AND, NATURALLY, YOU ALWAYS CARRY A SPARE SET. DON'T YOU? You'll know this feeling - your granddaughter has that rapt kiddie expression as she examines an earthworm. You whip the camera to your face and press the button to catch that fleeting moment - and nothing happens. Unconsciously, you press harder. Half a second later - an eternity - and the camera clicks. Darn! Missed the shot! Well, congratulations, you have just experienced shutter lag - the bane of just about every small P&S ever built. Now you press the shutter release half-way and MORE current flows to adjust autofocus and exposure. And when you completely press the release, there's a delay as the batteries muster their strength. Fear not - there is a solution. First off - if you have a viewfinder, switch off that power-guzzling LCD display. That'll almost certainly cut a huge amount of the lag. Need an even faster response? If your camera is set to 'on-demand' flash, switch it off unless you know you're going to need it - there is almost no point in trying to take a picture while the flash is charging. SuperTip - If you can foresee a shooting opportunity, you can do half the work in advance - point and frame in advance, pressing the shutter release half-way. That'll lock your exposure and focus, ready for you when the picture presents itself maybe three seconds later. Click! Gotcha! Now, there is a trend among manufacturers to eliminate the viewfinder and rely entirely on the LCD display. Look at the shelves in any camera store - I bet half the cameras lack a viewfinder. It saves manufacturing costs. Here's why. Quite apart from the power-saving consideration mentioned above, there's the simple ergonomics of taking a picture. When you frame through a viewfinder, the camera is bolted to a human 'tripod' - supported and steadied by a forehead and two arms clamped to the sides of your chest. The camera is locked to your bigger, steadier mass. Now consider the camera with just a display. To see it and frame, you hold the camera out in front of your eyes, held in the hands of two unsupported arms. It's not rocket science to know which is the steadier platform - especially when you're at the long, zoom end. Yes, the LCD is seductive, but a proper viewfinder will get you better, more considered pictures. If you're already stuck with a non-viewfinder camera, keep a look-out for fence posts, walls and trees against which you can rest and steady your camera. I've been meaning to pick up some of those rechargables for ages now. And yes, my P&S is LCD only. It was a special offer with Nectar points, and does lovely close-ups, but boy, the shutter lag! Fence posts are indeed my friends. The shutter lag thing is why I still like my Canon A-1. I'll live with the problems of film, thanks, like waiting till the roll is done and developed to see what I got, and no do-overs. I mean, I like my Casio EXZ-1000 P&S because it's almost always in my pocket. But I miss my viewfinder and hate the shutter lag. Yay! Another A1 groupie. I had a stable of three in regular use until 14 months ago when I finally grudgingly conceded that digital had 'grown up'. I now have a Canon 5D full-frame (which I love), and a crop 20D as back-up. But I still have one A1 + MD, coupled with the classic 50mm 1.4. It still works perfectly, even though it's almost a collector's item now! Sooooo thats why my batteries die so quick !!! Thanks for the advice Farclas...I will look into finding and buying rechargables. I do take a lot of photos when we are out and about...or especialy when were at the odd convention...Copenhagen over 1300 photos...LOL But I still would have had to take regular batteries for that trip, as we don't have the same voltage here as they did there...so it wouldn't have done me any good there...but here a rechargable would come in handy. Collector's item? I'm still haunting ebay for lenses. I have a 50mm f1.4, but it took me..... oh, I don't know how many years to get one. It was on a Canon EF that I bought a few years back. What I bought with the A1 way back when was an 85mm f1.8. Later on at a camera store sale, I bought the 35~70 f3.5-4.5 and 70~210 f4 zooms. On ebay, I've bought a power winder, 50mm macro with the 2X extender, and my latest aquisition, the wireless remote shutter release. I want a long lens. I'd "settle" for the 500mm f8 mirror, but I'd LOVE to be able to afford what I call one of the "white" lenses, say a 600mm. If you're talking about the mains voltage needed by your battery charger, a lot of them operate at quite a range of voltages. My camera battery charger is just as happy being used at 110 volts in the USA or at 240 volts in the UK. I just need to take a plug adaptor. The acceptable range of voltage should be written somewhere on the charger. The first time you charge them make sure you leave them in the charger long enough to ensure they are fully charged. Don't be tempted to rush the process. Some batteries have a memory and this very first charge defines their capacity.